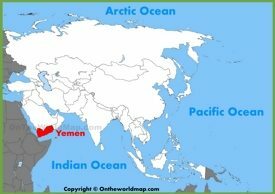 Yemen is officially named the Republic of Yemen. It is an Arab country located in Southwest Asia on the southern end of Arabian Peninsula. 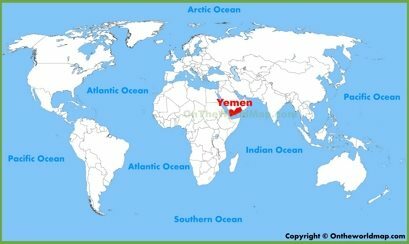 The neighbors are Oman in the east and Saudi Arabia in the north. It is bordered by Red Sea to the west, and Arabian Sea and the Gulf of Aden to the south. 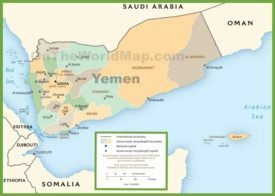 Yemen consists of more than 200 islands with the largest being Socotra. The capital and largest city is Sana’a. 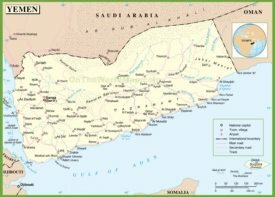 Although temporary the capital city since 2015 is Aden. The official language is Arabic. 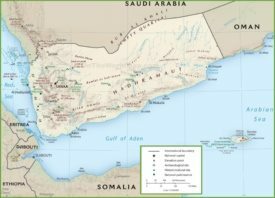 Yemen used to be home for one of the trading states called Sabaeans, later Jewish and then Islam. Area: 203,796 sq mi (528,076 sq km). Largest cities: Sana, Aden, Taiz, Al Hudaydah.